Miguel Delibes's 1978 novel El disputado voto del señor Cayo deals with political campaigning for the first democratic elections of the post-Franco era in Burgos and the villages in the surrounding area in June 1977. The novel valorizes the self-sufficient rural existence of Sr. Cayo in harmony with nature that is on the verge of extinction and attempts to bring the concerns of rural Spain to the political agenda of the transition. Boucher, Teresa. (1999). 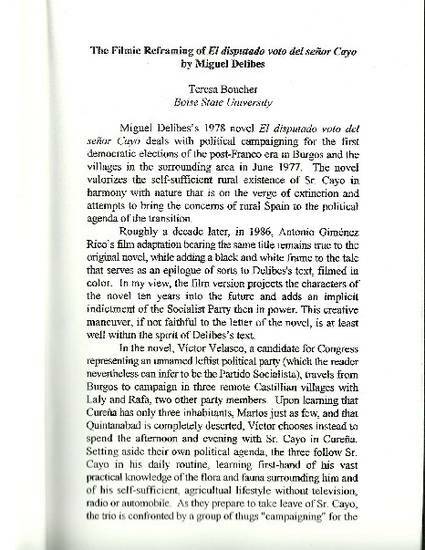 "The Filmic Reframing of El Disputado voto del Señor Cayo [The Disputed Vote of Mr. Cayo] by Miguel Delibes". Annual of Foreign Films and Literature: An International Journal on Film and Literature, 5,15-23.